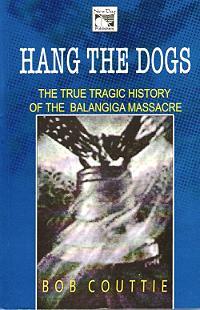 Hang The Dogs: The True Tragic History of the Balangiga Massacre is quite an intriguing title of a serious book. If the book, or any book for that matter on related title, were set in or were about the British Isles, where the author is originally from, it may outright invite distaste on sight from animal lovers of which Britons mostly are. Hang the dogs -- that's quite a harsh “edict”, coming as it does from a third party (the author) if addressed to a particular party or group alone involved. However, Bob Couttie's edict, if we call the title of his book on the Balangiga Incident as such, is an aphorism directed to the party that did something wrong, the party that should make amend. And in the Balangiga Incident both parties -- the Americans and the Filipinos, to varying degrees -- do need to make amend. In war the two sides, combatants if you will, try to outwit or beat one another. Hence, one side tries to "hang" the other in order to prevail. Whichever side has the upper hand takes the other side as a bunch of dogs to be hung -- “massacred” -- as did (according to historical accounts) the natives of Balangiga on 28 September 1901, if that is the most possible way to achieve what one or the party involved had set out to accomplish. Even scorch and turn a big island into a howling wilderness, as did the Americans to the island of Samar, in the Philippines, in revenge after the Balangiga Incident. The Balangiga Incident took place over a century ago. Therefore, the author’s imperative is now merely a gesture to catch a prospective reader's attention on a commodity in print -- a book. But "hang", which apparently is the author's metaphor for what amounts to kill, destroy, rid, or devour a century ago in war, is all the same throughout the ages. It still is -- to varying degrees. If Bob Couttie were to write a book on the war in Iraq, one could fairly anticipate his title, Strip the Dogs Naked: The True Tragic Story Behind Misled Intelligence. Something of the sort. The facts then emerge. He will portray, with unassailable proof, as he did on Balangiga, that those stripping the dogs naked, whether in a prison or elsewhere in high places of government are themselves dogs, and more. In Hang The Dogs the author actually turns out to be the one hanging the “canines”. He exposes, with unimpeachable evidence, the cravings of the Americans and the Filipinos to devour each other -- the Americans in their lust to create an empire, the Filipinos to resist and prevent being shamed. The “awod” (a local term for shame) factor was overriding among the Filipinos in Balangiga. Bob Couttie does not fail to point this out. So much about the title. Written largely in lean prose, the book is cool. Easy to read. It is the product of a ten-year assiduous research -- possibly the most exhaustive work on the Balangiga Incident thus far, and will remain so for sometime if ever surpassed. Yet still, ironically, at some point the author hedges for want of more facts that he stipulates must be somewhere in some repositories. The book provides a reasonably adequate background of the Philippine Revolution against Spain, as it does of the history of the island of Samar itself where the town of Balangiga, the epicenter of the book, is located. Here and beyond, the author discusses the ferment that led a people to rise in rebellion. Adequately given this background, the author takes the reader quickly to the Philippine-American War. Of the Philippine Revolution against Spain, of interest is the account -- for some reason largely unknown even to many in the Philippines who claim to have good college education -- about the death of Andres Bonifacio, the founder of the secret organization Katipunan that advocated armed struggle against Spain. The author leaves little doubt that Philippine history books -- which Philippine students studied (under ill-prepared so-called professors) in some allegedly reputable schools, particularly in the decades of the ‘60s through the mid ‘80s -- had the truth swept under the rug. That is of course the period largely of the Marcosian era. And whoever may dispute Bob Couttie’s facts only exposes her/his inadequacy or ignorance. The author candidly discusses the sad event leading to the execution of the Katipunan’s “Supremo”, the title that the founder of the secret organization had chosen for himself. The next scenario becomes predictable, the emergence of Emilio Aguinaldo, Bonifacio’s rival who displayed considerable talent early in his military career, as an undisputed military and civilian leader of a people who for over three centuries had yearned for freedom. The unfurling of a full-blown revolution inevitably arrived with Aguinaldo on the center stage. Hang The Dogs meticulously examines the events and motives behind the truce, better known as the Pact of Biak-ana-Bato, in the revolution against Spain. It was a truce neither side fully intended to honor. Each side was merely buying time in order to resume hostilities at an opportune, hopefully not-so-distant, future time. When the Spanish authorities in Manila reneged full payment of the sum promised, the revolutionaries, who agreed to go on exile to Hongkong under Aguinaldo, started buying arms with the partial amount they received while at the same time unsuspectingly courting help from America through her functionaries in the Far East. Being at war then with Spain and who had a grandiose design for a ward in the Orient, America was inauspiciously eager go help. The book narrates the alleged deals entered into between the Americans and the revolutionaries that found Aguinaldo back in the Philippines resuming the revolution against Spain. Such deals, in the American perspective, weakened Spain’s ability to wage war against a neighbor, Cuba, who herself was fighting the Spaniards also to win independence. However, in the perspective of the Filipinos, America was helping Aguinaldo win independence from Spain. This was not the case, Hang The Dogs delineates. The false promises given -- perfidies, if you will -- by the Americans to the revolutionaries set the stage for confrontation. The author makes it clear the Filipinos were dealing with the wrong American representatives who deceptively made it appear they were the right authorities. The intransigence of both sides, upon discovery of what many would now call deceptions on the side of the Americans, was feverish. The Americans, already assured by Spain secretly of a real estate in the Orient called Filipinas, were more steadfast. The Filipinos, although recognizing their inferior arms and absence of foreign support, set their feet dug-in nevertheless on the ground. The whole episode exploded on the first week of February 1899 into what is called the Philippine-American War. The road to Balangiga (to Catubig, Quinapundan, and elsewhere) in Samar was laid, the trap for disaster set. Along with other factors, the Filipinos could not win that war against the superiority of men and material of the Americans in those days, the author makes it clear. Predictably that war ended upon Aguinaldo’s capture in a ruse at Palanan, Isabela, on March 23, 1901. However, hostilities, to the credit of the Samarnon fighters under General Lukban via Balangiga, etc., did not formally end until only 10 days short -- September 18, 1902 -- of the first anniversary of the Balangiga Incident. On that date General Lukban gave up, becoming the last general of the Philippine-American War to surrender. In the foregoing analogy, the author, while in part correct, has his rare lapse of logic. He neglects to qualify his assertion that in the case of Vietnam, China and the then mighty U.S.S.R., all foreign powers, supplied the guerilla fighters with their fighting “implements”, including some components of their booby traps. Whereas the Filipinos, borne out by an industrial base that did not exist, merely availed themselves with the arms they could provide through crude, inadequate, local manufacture and whatever meager quantity they could procure from elicit foreign sources, in addition to those they captured from the enemy in the battlefield. They sought aid from Japan, then already a powerful neighbor, but in vain. Apart from but coincidental with France, Russia, and Germany, she had her own design. On the other hand, the author does not overlook the fact that Aguinaldo (but only out of extreme necessity and too late in the Philippine-American War) introduced a first in any military struggle, his “flying column” tactic which is nothing but the guerilla warfare. In the guerilla warfare that the author alluded to with the less modern arms of the Vietnamese, the Filipinos were in the cutting edge of the military strategy as already seen, heretofore then unproven against a powerful foreign military, in the same manner that they were in the cutting edge in establishing the first democratic republic in Asia. Whereas, the Vietnamese employed it -- i.e., the guerilla warfare -- after Aguinaldo and Lukban prototyped it and refashioned to perfection in the 1930s through the early 1940s by Mao Zedong in his struggle against the Chiang Kai- shek’s Kuomintang. Bob Couttie appropriately depicts the cultural aspect that served as the underpinning of the resentment on the side of the community at Balangiga against the Americans. Under Lukban, a leader gifted with military talent of some measure, the Balagiganons rose to the challenge of the occasion. They did not turn away from the bloodshed that they knew could not be avoided. Many commentators early on, especially American pundits, had called the incident at Balangiga a massacre, with a strong connotation of being immoral because of the sneak attack. Some still do. The fact is that it was not a massacre in the immoral sense like if the victims were sleeping. And even if they were, the American soldiers primarily responsible for the collapse of security could only have been court-martialed for negligence considering they were at war. The assault took place in broad daylight with the sentries of the Americans in place. If what happened was a massacre, then all acts of war involving surprise -- commando raids, for example -- are immoral, including Col. Funston’s disguised capture of General Aguinaldo. Of course in the case of the Balangiga Incident there were no more soldiers to court-martial. Virtually all were wiped out. But “surprise” per se is a vital factor to a successful military operation which a commander would readily resort to whenever possible. The late Fleet Admiral Nimitz, one of the greatest naval commanders the U.S. had produced in WWII, had a nine-point formula for a successful military operation. Number five of them is “surprise”. To him the Balangiga Incident was not a massacre; it was a “rout” (unwritten portion, interview with this reviewer, August 22, 1964). That the author of Hang The Dogs pays attention with reasonable details to the preparation of the local populace and assiduously portrays the awry of the fighting should settle the question many had posed on whether the Americans were justified in their unmeasured revenge, the wanton killing and the razing of Samar that followed. The taking of the Balangiga bells is an interesting aftermath of the incident. Filipinos are passionately longing to get them back. They would even settle just for one. Hang The Dogs discusses the legal let alone the ethical bases of the Filipinos’ right to get the bells back and the Americans’ lack of it to keep what they claim to be war booty. Negotiation for the return of the bells had been tried for so long but to no avail thus far. This purports to show also that even through diplomacy, which the Filipinos have resorted to even with bended knees, might still dictates the terms. Hang The Dogs clearly implies America is too powerful as to arrogate by ignoring the helpless Filipinos. Note: In the copy this reviewer got most of the entries in the index cannot be referenced to the indicated pages.